Forget about needing extra servers for your App, you have UbiFunctions, a serverless computing environment for the IoT. 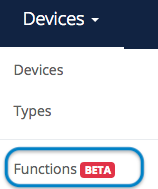 Also known as FaaS (Functions as a Service), Ubidots’ serverless function environment allows you to run custom functions on-demand, directly from Ubidots cloud. An UbiFunction is user-defined code that runs, on-demand, by either (1) making an HTTP GET or POST request to the UbiFunction’s URL automatically created by Ubidots, or (2) based on a predefined repeat interval. Ubifunctions is an on-demand service that can be added to any Ubidots plan for $29/month for the first 100,000 executions. Most web applications have an API and in most cases, you’ll be able to access your data programmatically without much difficulty. Imagine you have a Bitcoin cluster and want to turn it on or off based on the Bitcoin/Energy price relationship? Or let’s say you want to research the relationship of a commodity price with specific weather conditions? Use UbiFunctions to run your code periodically and query 3rd party APIs to extract Weather, Energy, or Currency data and aggregate the time-series data in Ubidots for analytics and action. There may be cases where an HTTP communication with Ubidots is not possible locally, or changing the HTTP methods, payload, and/or URLs is just too painful. Last but not least, being able to run custom functions on top of your datasets by accessing the power of Python and Node.js from your Ubidots account. With UbiFunctions, you have access to most features and libraries that make these programming languages the favorites for data transformation and analysis. Step 2: Give the function a name. Keep in mind this name will later become part of the function’s URL. By default, every new UbiFunction is populated with a sample code that uses input data (TOKEN, Device, & Temp Value) to make a request to Ubidots API. This sample code demonstrates a simple HTTP GET endpoint that receives an Ubidots token, a device label, and a temperature value as URL parameters, then uses this data to make an HTTP POST request to Ubidots API. You can actually test the sample function by clicking on the button “Make it live”, then paste the URL below into your web browser, updating the Username and TOKEN of your account. NOTE: The identifier of any function within UbiFunctions is simply the name assigned. Here, the test function is named "new-function" and accordingly, by testing the sample function provided, the UbiFunctions engine will identify this particular function in your account (no one else's) and report back a Temp Value and TOKEN. You may now begin coding your function. Please note the return payload must always be in a dictionary format. Sending a single variable cannot be understood and must be returned in a dictionary format. During the development process, you will want to test your function to see if you are on the right track towards the desired output. To do so, click on "Run Function." This will being up an modal screen requesting some input data to test with. 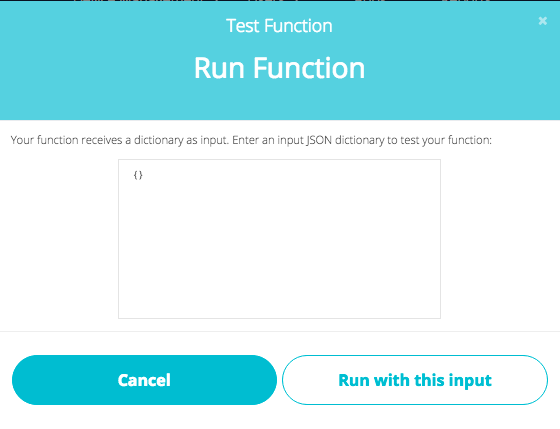 If your function requires an input, you need only enter a JSON dictionary of sample inputs. You may leave this blank if your function does not require an input. Output: This is what your function returns. It must be in a JSON dictionary format. In your code, make sure to use "return" to quit the function and return the dictionary. Console: This is used to debug purposes. Use console.log("hello") to leave trails in this console. Sample function: Parses the URL parameters of an HTTP GET request, and then uses them to make an HTTP POST request to Ubidots. 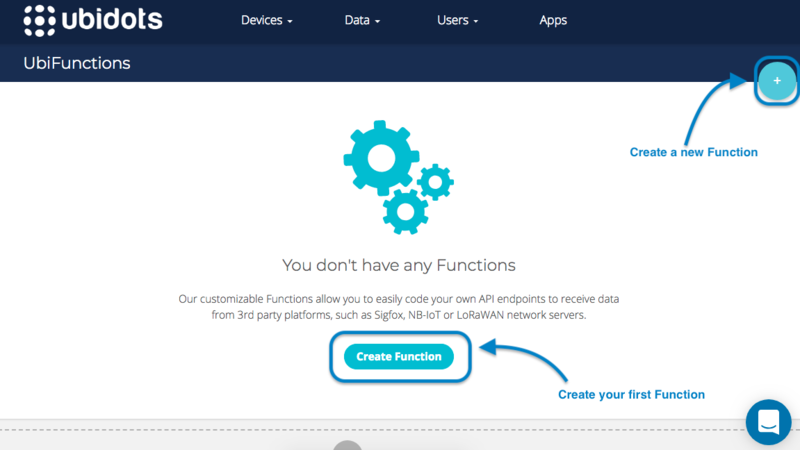 UbiFunctions is an add-on to any Ubidots license for $29/month. The UbiFunctions add-on can enabled at any time from billing section of any Ubidots Admin account or by clicking here. Need help coding your Ubifunction? Feel free to ask for help to our support team via the in-app chat channel or via email at support@ubidots.com. Want to share a helpful function to teach others how to connect the dots? Feel free to post it at community.ubidots.com and help another IoT innovator achieve their goals.